Four young Hawaiian monk seals will get a second chance at survival as the first patients admitted to the world’s only facility dedicated to the rescue and care of this critically endangered species. After years of dreaming, planning, fundraising and building, we’ve finally opened our doors to patients at our Hawaiian monk seal hospital, Ke Kai Ola (The Healing Sea). Thanks to people like you, this $3.2 million facility near Kailua-Kona on the Big Island of Hawaii will now provide vital rehabilitative care to seals who cannot survive on their own. And for a species as critically endangered as the Hawaiian monk seal, a population estimated at fewer than 1,100 individuals, every animal counts. Kūlia is a female Hawaiian monk seal pup that was rescued at Pearl and Hermes Reef in the Northwestern Hawaiian Islands. Researchers from The Marine Mammal Center and the National Oceanic and Atmospheric Administration (NOAA) rescued the seals during a 26-day research mission in the Northwestern Hawaiian Islands. This 1,200-mile archipelago of small islands and atolls is home to about 900 Hawaiian monk seals. Unfortunately, that population is in decline primarily due to poor juvenile survival. Alarmingly, fewer than one in five Hawaiian monk seal pups in the Northwestern Hawaiian Islands survive their first year due to threats like entanglement in ocean trash, changes in the food chain and predation. Every year, researchers monitor the Hawaiian monk seal population and intervene when necessary by disentangling seals from debris or moving them to areas of higher survival. This year, aerial surveys helped researchers identify seals on the beach and in the water that might need help. The four young monk seals they rescued—two from Pearl and Hermes Reef and one each from Midway Atoll and French Frigate Shoals—were all underweight for their age and unlikely to survive on their own. After being fed and cared for at Ke Kai Ola, the seals will be returned to the Northwestern Hawaiian Islands. Up to 30 percent of the Hawaiian monk seal population is alive today because of efforts by the NOAA National Marine Fisheries Service and their partners, like The Marine Mammal Center, to help recover monk seals over the past few decades. Our new facility will allow even more young monk seals to be helped. Our monk seal patients were transported to the hospital on the Big Island via the NOAA Research Vessel Hi‘ialakai and then ferried to shore two by two. The Ke Kai Ola facility includes two rehabilitation pool areas for newborn seals and two larger pools for juveniles, plus quarantine pen areas. Kūlia and Ikaika become acquainted in the new pools at the Hawaiian Monk Seal Hospital. A medical lab, staff office, patient food prep kitchen and education pavilion are in the final stages of construction. 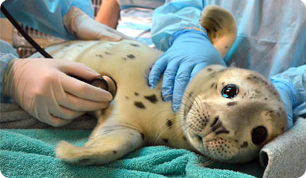 An official grand opening will take place later this year, but we didn't want to wait another moment to start providing care for these seals in need. Kūlia, Ikaika, Hālaʻi and Maka’ala will be cared for by veterinary experts from The Marine Mammal Center and NOAA, as well as a strong community volunteer base in Hawaii. While our hospital will not be open to the public, we will be conducting public outreach programs to provide education about Hawaiian monk seals and conservation efforts. Learn more about Hawaiian monk seals and how you can support their ongoing care at our new hospital. that are the first patients at the new hospital. Help save Hawaiian monk seals today! Read about the new Hawaiian Monk Seal Hospital. Learn about Hawaiian monk seals! Learn about Ocean Trash and how to prevent it! Build a Hospital. Save a Species! "A dedicated monk seal hospital will give more pups a better shot at survival and adult seals a second chance when they need it! This is an essential part of our plan for their survival." -- Charles Littnan, Lead Scientist, Hawaiian Monk Seal Research Program, NOAA Fisheries Service. Hawaiian Monk Seals Need You!